A relaxing tour in Florida turned into something of a white knuckle ride for tourists when a large alligator launched itself into their airboat. A group of people were exploring Florida’s tropical wetlands last week when the scaly carnivore decided to gatecrash. According to the Miami Herald, four passengers and a tour guide were travelling in the boat at the time. 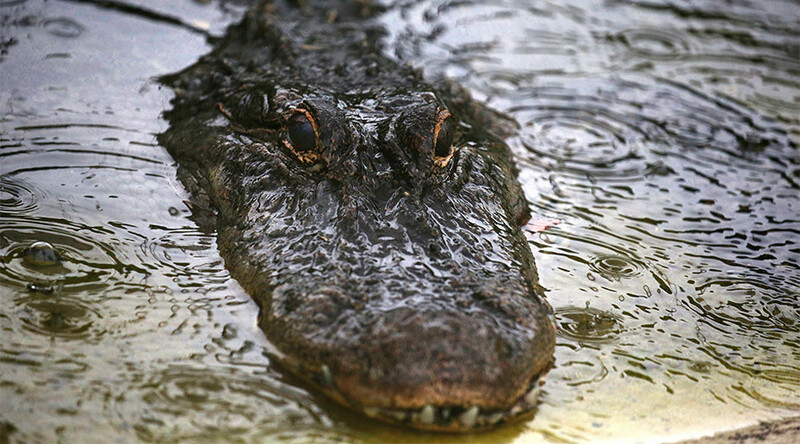 Astonishingly, the incident was broadcast on Facebook Live by Tylor Hindery and shows how an alligator lazing on an embankment makes a sudden move to join the tour. Screams of horror can also be heard as the alligator briefly gets stuck between the bars of the vessel. Hindery admitted online that at one point he thought he was a goner. In the footage, a guide can be heard conversing with passengers just before the gentle boat ride takes a sudden turn for the worst. Hindery’s wife Emerald described the panicked rush to get out of the creature's way. “We couldn’t believe it was really happening, everyone was scrambling around and trying to get to the back. “I stayed in my seat for a half second, then Tylor grabbed me and I somehow ended up in the driver’s seat,” she told the Orlando Sentinel.